How can radiation energy heat a body? How is this heating connected with the body properties? The aim of this activity is to show the evidence of the energy transmission by thermal radiation, with respect to heat conduction and convection, between a source of radiation and an home-made radiometer. • N. 1 visible light filter. 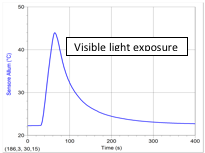 It is possible to build a visible light filter in a simple and economical way by using two layers of color film impressed to sunlight and developed. The layers can then be fixed to a transparent plastic support (crilex) for a more practical use. Building procedure: We cut the cans in order to obtain three aluminium plates of equal surface 4x7 cm2. We paint one of these plates of a black gloss paint and another one of a white paint; the last one is left unpainted. We connect the back of each plate with the tip of the surface temperature sensor by a small piece of scotch tape. After that, we mount the three plates on polystyrene supports. The reason of painting the plate surface of our home-made radiometers is based on the everyday experience of dark object exposed to solar radiation that show higher surface temperatures with respect to lighter ones. The unpainted aluminium radiometer faces the halogen lamp at a distances of 25 cm from the light source. The lamp is switched on and the radiometer is illuminated for 30 seconds, after that the lamp is switched off and removed. The temperature of the radiometer plate is recorded as a function of time: it rises until a maximum value is reached and subsequently starts a decreasing cooling trend. • Third question: we know that the energy could reach the surface of the radiometer by heat conduction, convection and radiation, but which of these mechanism is dominant here? How can we discriminate among the various mechanism? In order to answer these questions the teacher can repeat the experiment by using also a classical thermometer (not illuminated) which is used to measure the temperature of the surrounding air. After 30 seconds of light illuminating the radiometer in the same condition as before, we measure the temperature of the air between the halogen lamp and the radiometer plate and find that there is not any significant change on the air temperature with respect to the room temperature measured few seconds before the light transmission. If a change of air temperature in the space between the lamp and the radiometer is not observed, this means that the transfer of energy from the lamp to the radiometer plate is not due to heat conduction or convection in the air. Therefore, the dominant mechanism of energy transmission is different and can be ascribed to lamp radiation.It is also possible to answer the third question by repeating the experiment so that the surface of the radiometer is not frontally exposed to light of the lamp, but the lighting is made at a certain angle of inclination (see figure). For example, first the plate of the radiometer is placed at 45 ° with respect to the incident light and then at 90 ° with it, without significantly affecting the total distance between the light source and the radiometer. The experiment will show that the greater the angle between the surface of the radiometer and the incident light, the lower the temperature change detected by the radiometer. If the heating was to be ascribed to conduction through the air, there should be no significant difference between the various cases of inclination of the radiometer, while in case of irradiation the angle formed between the radiometer and the incident light should critically influence the variation of temperature detected by the radiometer, as it happens. • Fourth question: the temperature increase of object exposed to solar light is a well known phenomenon. We already know that the solar light propagates through empty space and heats up the atmosphere and the objects on the Earth surface. What happens if we eliminate the visible component of the radiation emitted by the lamp? In order to further explore the transmission of energy by thermal radiation the teacher can repeat the same experiment as before, but now filtering the visible light incoming on the radiometer plate. An increase of the radiometer surface temperature, even in the case of total absence of visible light, is evident. The temperature increase and the following cooling trend is recorded as a function of time and compared with that observed in the presence of light. The maximum value of the temperature reached in this latter case is lower than the one measured without filter.